I never get tired of telling a good story, and this one certainly makes that list. Two of my favorite pickers – let’s just call them Frick and Frack, tend to find some amazing stuff. I have bought things from them purely for aesthetic reasons over the years, and have never been disappointed. They have a great eye. It’s so important when being a picker because you may not know what you are buying, but if you can tell it’s “Something” you’re a step ahead of most of the pack. And these guys have had some pretty amazing scores just buying on a hunch. This week’s story is just one of the many…. Apparently several years ago they were at an estate sale buying a few things when a pair of what looked like cameo’s caught their eye. They noticed the items had a Sotheby’s auction tag on the back. This would generally indicate they are somewhat special. The tags dated all the way back to 1903! Once they got them home, they contacted Sotheby’s. Unfortunately they were not much help. They told them they were 18th century and that was all they knew. Hrmph! 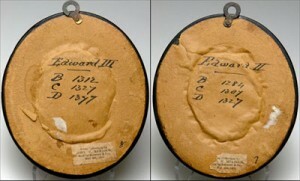 Come to find out, these pieces were from the very well documented John Gormley Murdoch coin and medal collection. 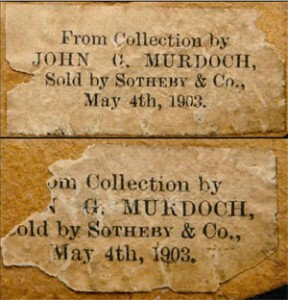 The auction was 8 sessions – running from March 31, 1903 to December 13, 1904 at Sotheby’s & Co., London. 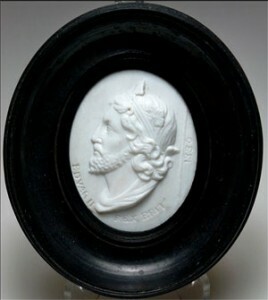 The back of each framed piece is notated with the identity of the subject, which happens to be Edward II and Edward III; along with their date of birth, coronation and death. 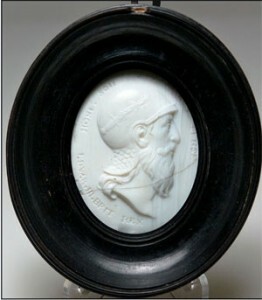 But you may already be somewhat familiar with his work if you have visited the V&A Museum. So how does the story end? Will Frick and Frack keep them or will they head off to a big auction and sell for hundreds of thousands of dollars? You’ll just have to tune in here to see….